celebrates films featuring momentum-based dance created by some of the top creators and dancers in the field of Contact Dance Improvisation. It provides a unique opportunity for both film and dance lovers to experience the joy, chaos and intimacy of human connection through physical movement. The Festival runs every two years on the odd years and is presenting its fourth season June 29 to July 1, 2019. Contact dance improvisation is a social dance involving touch, in which momentum between two or more people is used to create and inspire dance movements. The form is similar to martial arts practices such as Aikido that use momentum and rolling point of contact in defensive moves. Contact dancers use these practices not to defend themselves but to communicate, dance and express. In Contact Dance Improvisation there is no set leader and follow as there is in other social dances such as tango and salsa. Instead of having these roles set, the dancers will sometimes follow one another and sometime lead and interchange these roles seamlessly. The form is egalitarian, requiring a deep “listening” and responding in the moment, to one’s partner, with no pre-set roles. The dance form is practiced with or without music. Techniques include rolling point of contact, balancing over a partner's centre of gravity, following momentum, and "listening" with one's skin surface. 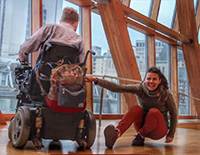 Contact dance improvisation is accessible to people with no previous dance training and to people with physical disabilities. It is typically practiced in a jam situation in which a group of people gather to improvise together. These jams occur around the world and include people of all ages and training levels. REAson d'etre dance productions is a charitable dance company that teaches and inspires the public about contact dance improvisation and dance/theatre through the creation and production of classes, workshops, jams, films, performances and festivals that use contact dance improvisation, vocalization, text and physical theatre to express the human condition. The company also strives to bring contact dance improvisation to people of all ages and training levels and to ensure the accessibility of the dance arts to the public through inclusive programing and scholarship programs. We strive to provide programing that enables the public to benefit from the enlivening powers of expression through movement. REAson d'etre dance productions founded and produces the Contact Dance International Film Festival which had its inaugural debut in Spring of 2013 and is produced every second year going forwards. Kathleen danced with Ballet Jörgen Canada, National Ballet of Canada & Tiroler Landestheater (Austria). 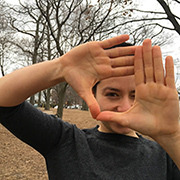 Kathleen is a certified instructor of the Melt Method (Hand and Feet) and teaches Contact Dance Improvisation at George Brown Dance. She has choreographed over 40 dance works and been nominated for five DORA awards. Her film Lapinthrope, co-produced with Alec Kinnear won Gold Award at the Festival Der Nationen (Austria). Kathleen is also a recipient of a K. M. Hunter Choreographic Award and is a published author (“The Healing Dance”, Charles C. Thomas). She has a Master’s in Expressive Arts Therapy and is a Registered Psychotherapist (CRPO) with a private practice for the past 15 years. In January 2015 Kathleen became a candidate teacher of the Axis Syllabus. Recently Kathleen graduated as a Brian Advancement Coach (Pyramid of Potential Method). She is the director of REAson d’etre dance productions which produces both the Wednesday Dance Jam and the Contact Dance International Film Festival.